Outside of breeding season, marbled salamanders are very solitary. 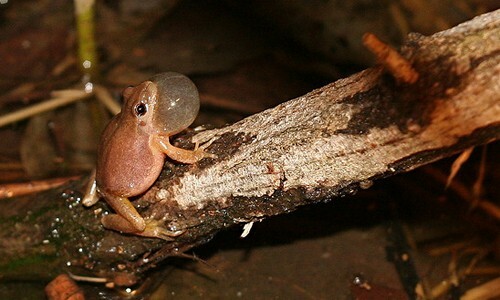 They live in forested areas with damp ground, near bodies of water like creeks or ponds, and spend most of their time in burrows or under layers of leaf litter. Because they are nocturnal and often underground, they are not often seen. 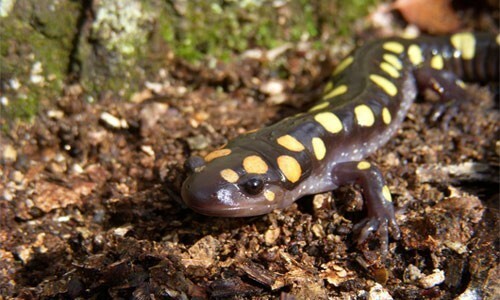 The marbled salamander is found throughout most of the Chesapeake Bay region, with the exception of the New York and northern Pennsylvania portion of the watershed. The marbled salamander is relatively small, growing three to five inches in length. Adults are black, with silvery crossbands along their bodies. 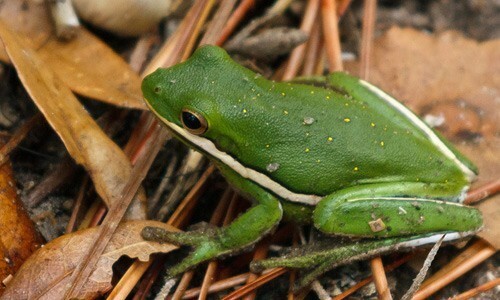 Females are slightly larger than the males and tend to have gray crossbands, while males’ crossbands are whiter. Young salamanders have small flecks rather than the signature crossbands. Marbled salamanders are carnivores that hunt by tracking movement and smell. They prey on small insects, worms, slugs and snails. Larvae feed on zooplankton until they grow large enough to hunt. Like many salamanders, the marbled salamander has poisonous glands on its tail to protect it somewhat from predators. However, it is still vulnerable to a variety of forest predators, including owls, raccoons, weasels and snakes. Marbled salamanders breed once a year in the fall. The male attracts a mate with a circular dance and tail movements. The female lays 50 to 100 eggs on dry land in a depression. She will stay with the eggs until it rains and the depression fills. The larvae hatch once the eggs have been covered in water for a few days. The larvae, which are fully aquatic, grow quickly and take anywhere from two to nine months to metamorphose. The juveniles, which are flecked rather than banded, live on land and mature in another 15 months. Marbled salamanders can live for four to ten years. The marbled salamander is part of a family known as mole salamanders. Unlike most of the family, the marbled salamander breeds in the fall and on land. If no rain comes once the eggs are laid, they may be able to overwinter and hatch in the spring. Marbled salamanders can metamorphose more quickly in warmer climates, taking as little as two months. In colder areas, it may take up to nine months.